Moishe House New Orleans provides a home and space for social programing capable of enriching the local community. Central to our mission is a focus on the Broadmoor Neighborhood and Jewish culture and religion. The 5th Annual Broadmoor Fest sponsored by the Broadmoor Improvement Association and Ochsner Baptist Medical Center! This event is FREE and open to the public with food, entertainment, kids activities and fun for all ages! Come enjoy excellent food vendors serving a variety of delicious home-cooked fare, cool treats, and refreshing beverages. Raffle prizes sponsored by the BIA include local restaurant gift certificates, passes to WWII and Ogden museums, Rock 'N Bowl package, Broadmoor Fitness pass, jewelry and more! Ochsner Baptist Medical Center is the official sponsor of the Broadmoor Fest Music Stage, featuring musical performances by Andrew Duhon and the Lonesome Crows, Wild Bill and the Juanderers, Sunpie and the Louisiana Sunspots, Coot, The Dirty Rotten Scoundrels String Band, Kinfolk Brass Band with Dancing Man 504, the Andrew H. Wilson Charter School Music Ensemble, F&S Dancers, and much more! Community info stations will also provide helpful services, including a dogwash fundraiser sponsored by the Broadmoor 4-H Club and free asthma counseling offered by two nationally certified asthma counselors. MoisheNOLA would like to thank you all for your participation in a fantastic month of January events! Your enthusiasm is an inspiration to us, and we hope that you continue to share with us your ideas and feedback so we can continue to provide events that are both fun and meaningful to you. Our February 2010 calendar is filling up, and features several of your ideas from December’s‘MoisheNOLA Visioning Session’. Keep an eye out for emails with additional event details and follow us on the MoisheNOLA Facebook page where you can read up on our upcoming events and view pictures from past events. We’ll be hosting a bike TuneUp/decorating night in preparation for Mardi Gras.Check out the Facebook page for more info. Jeff’s excited about the decoration he picked up cheap at Dollar General and spray painted Black & Gold.You may bring your own flair or tuneUP tools, but the house will provide some for you to use. Keep an eye out for Moishe House as we join KdM for the second year. The Krewe du Vieux was founded in 1987 from the ashes of the storied Krewe of Clones. This wild, satirical Carnival parade first marched in 1978. Moishe House introduces Dr. Calderone for the first Meditation and Relaxation Workshop. Dr. Calderone is a professional who leads a conversation at yoga studios in New Orleans and will provide tools and a guided conversation to help the community find center before moving into Mardi Gras. Location: Rendon Inn – 4501 Eve St. The Saints are heading to Miami! If you don’t already know, the Rendon Inn hosts one of the hottest Saints game-day parties in town. Great food, cheep drinks, and DJ spinning Saints Jams. Voted as 1 of the top 5 places in New Orleans to watch a Saints game. Location: TBD – check facebook! Bike down and meet-up with the zulu and rex krewes down by the muddy Mississippi. Second lines, food, music and fanfare. Tess Monaghan – certified yoga instructor – hosts her monthly Moishe House yoga class. Approximately a one-hour class, you’ll leave feeling relaxed and realigned. This class is open to all skill levels and a great opportunity to get some one-on-one instruction to refine your skills. Floor mats are available for purchase from Tess day of, or bring your own. Location: The Spotted Cat – 623 Frenchmen St.
Join the Moishe House for swing dancing in the Marigny. We'll start at Spotted Cat with the Loose Marbles, and Joey will provide dance instruction as we swing down Frenchman. Get on out and enjoy (swing to) some live local music! MoisheNOLA’s monthly shabbat potluck is without a doubt our house’s most special event of the month. This is a great chance to catch up with your friends, make new friends, and enjoy great food in the comfort of our home. We encourage you to bring your friends who don’t know MoisheNOLA so that they can become a part of our monthly tradition. As always, please bring an appetizer, entrée or dessert to share. This will be the Moishe House’s first Homeroom event. ‘Homeroom’ is an opportunity for the diverse network of MoisheNOLA to share and present on the exciting projects that are going on their professional lives or projects of personal interest. Moishe house supporters are doing amazing work in New Orleans, and ‘Homeroom’ is a chance to share these interesting projects, get feedback, and garner support for your initiative. Currently accepting presenter positions – please contact Jeff, Gill or Jon if you are interested in presenting your work. In February we’ll be sending out an invitation to attend a group session of Wicked at Mehalia Jackson Theater. We’ll be buying tickets midway through Feb based on RSVPs to a Facebook invite. An evening conversation with a local Pastor and Rabbi is sure to be an interesting discussion. We’ve been in conversation with our Rabbis and are reaching out to a 9th Ward and Central City Pastor to help with a Talmud/Bible Study. IF YOU HAVE AN EVENT OR PROGRAM AND NEED SPACE, LET US KNOW. WE MAY BE ABLE TO HELP!!!! Thank you for participating in Moishe Nola's Visioning Sessions. Pasted below is a list of events and ideas that were brainstormed by the group. We appreciate all your help in this collaboration and look forward to putting your ideas into action. Your interest and excitement about your ideas means a great deal to us, and is a tremendous asset of our Moishe House network. Also, help us by taking a brief 2 minute Moishe House survey. 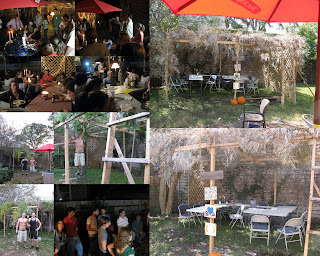 Friends and Family came together for MoisheNola's 2nd Annual Sukkot. This past Friday night we were joined for a potluck dinner in our backyard Sukkah. The group included a regular cast of characters and a visit from a few family members in from Boston and Philadelphia. 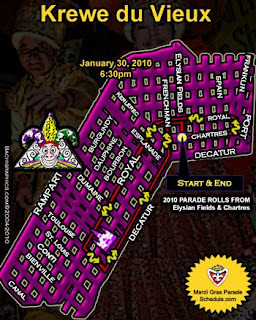 Next Year join us for the celebration, or better yet start looking ahead to Mardi Gras. This year it is conveniently held on a Tuesday, allowing for a weekend of buildup and celebration! !